Patricia:	Hello, and welcome to the Hearts of the Dulcimer podcast. My name is Patricia Delich. Wayne:	And I'm Wayne Jiang. This podcast is dedicated to everything about the mountain dulcimer: the dulcimer's history, dulcimer music, dulcimer builders, dulcimer communities, dulcimer culture and much, much more. If you are interested in the mountain dulcimer, this is the podcast is for you. Please subscribe. We'd love to hear from you if you have a topic that you'd like us to cover. Go to our website, dulcimuse.com/podcast, to send us your ideas. Patricia:	Joining us today are two guests with two different personal stories about Joni Mitchell's dulcimers. The first story is from Joellen Lapidus, a luthier from Los Angeles. Joellen tells us the story of selling a dulcimer to Joni at the 1969 Big Sur Folk Festival. In the second story, Rick Scott, a premier dulcimer player from Canada, recalls the story of being picked up by Joni while hitchhiking in Canada in 1971. While making our documentary film, Hearts of the Dulcimer, we asked dulcimer players where they first heard the dulcimer and what inspired them to begin playing. For many who lived on the West Coast in the '70s, it was Joni Mitchell's Blue album. The simple sound of the dulcimer was a perfect match for her honest and self-reflective songs, "All I Want," "Carey," "California" and "A Case of You." Rolling Stone Magazine lists Blue as No. 30 in their list of the 500 greatest albums of all time. The incredible success and visibility of Blue helped bring the mountain dulcimer into mainstream audiences. Our first guest today is Joellen Lapidus, who created the dulcimer Joni played on Blue. Joellen has definitely been living an interesting dulcimer life since the late 1960s. Not only does she build visually stunning dulcimers, but she also sings and plays the dulcimer with complex rhythms, while incorporating a variety of musical genres from folk to jazz to Arabic rhythms. She has also written comprehensive instructional books on how to play the dulcimer in her unique style. You can hear the sophisticated mix in her latest CD, Dulcimer Music for the Pelican Ballet. We featured Joellen in our film, Hearts of the Dulcimer, as part of the Big Sur counterculture experience in the late 1960s and early '70s. Today we're going to dive deeper into that part of Joellen's life. We started our conversation by asking how she landed in Big Sur, where she eventually met Joni Mitchell. Joellen:	In 1967 I left New York after college, one year after college, to just start a new life on the West Coast. And I had some friends in the Haight-Ashbury. I guess I was a little flaky because I forgot to tell them that I was coming out to the West Coast - and, when I got there, they weren't there. So, I had some other friends that I knew lived down in Big Sur at this place called Esalen. So when I went to Big Sur, I was sitting on this gigantic, beautiful green lawn overlooking the Pacific Ocean; and there was a group of people on the lawn and I was just watching them. And, suddenly, I heard this incredible peal of delicious laughter. And this woman got up. She took off all her clothes. Everyone else stood up, took off all their clothes, and they all ran across the lawn and jumped into the swimming pool. And I said to myself, "This might be an interesting place to live." Patricia:	After settling in Big Sur, Joellen decided to start making dulcimers. Joellen:	I had made some plans for dulcimers with my chemistry teacher, who made guitars. So I had these plans with me and I said, "Gee, I could start building dulcimers here. This is such a beautiful place." So I started buying one tool a week. And I bought a piece of eighth-inch plywood and I cut out the pieces all by hand - I had no power tools - and I built this coffin-shaped dulcimer with three strings. In those days, which are 1967-68, when a woman did woodwork, men were kind of tickled by the fact that a woman was doing woodwork. So they would lend me their tools and kind of put up with me. Anyway, so I got the idea to do the violin shape. And that's when I started buying these huge two-inch slabs of walnut and cutting them out with a jigsaw. And then I just sanded it, sanded the curves. So, I made a number of instruments that way. Patricia:	As Joellen built more dulcimers, many people in Big Sur started buying them. Over time, the design of her dulcimers became more artistic and her confidence increased as a luthier. In 1969 Joellen decided to do something bold with her dulcimer. Joellen:	One day I found out there was going to be the Big Sur Folk Festival and I thought to myself, "I'll make a dulcimer and call it the Festival Model. And I'll sell it to either Joni Mitchell or The Incredible String Band." They were both my idols at the time. Like a little bit of an egotist, I told all my friends and they said yeah, yeah, yeah. So, anyway, I went out into woods, looking for inspiration, and there were these beautiful red, wild columbines. And I just thought, "That's it." So I did a sketch and I came back where I lived, and I started building the Wild Columbine Dulcimer. It wasn't even completed the day of the festival. I hadn't put the finish on. 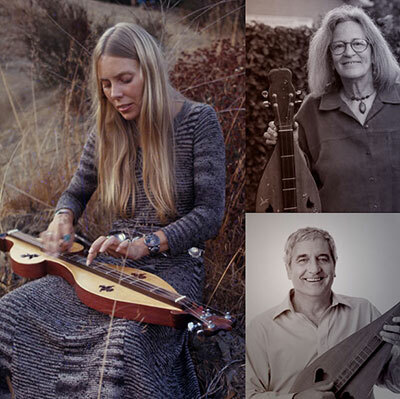 I brought it to the festival - since I worked at Esalen, I got in before the regular folks came in - and I saw Joni walking down the path and I just put the dulcimer right in front of her. And she noticed it and she came over and she said, "Oh, what is that instrument?" And I said, "It's a mountain dulcimer." She said, "Well, what does it sound like?" So I played for her and I told her, I said, "You know, this is something that you could really get into because it's all open tuning." So I showed her a few things and then she played it, and she said, "Is this for sale?" And I said yes, and she said how much, I said two hundred dollars, and she said, "Well, I think I would like to buy it. But I have to go right now. Can you bring it to my room later?" And I said, "Sure." Meanwhile, my friends and I are practically dying. We are so excited. We just can't believe that this is actually happening. And then I did go back to her room later, brought her the dulcimer, and told her that it needed finish. But she was staying in Big Sur for another few days, up the road at Deetjen's, the Big Sur Inn. So we agreed to get together a few days later. And so a few of my friends and I got together with her up at Molly's Cabin, which is above Deetjen's Big Sur Inn, and we played music all afternoon. And it was just thrilling. She did some vocal stuff, filling the canyon with her voice, that I will never forget. Patricia:	In early 1970 Joni took the dulcimer she bought from Joellen on a European trip. From the Mediterranean Greek island, Crete, she sent Joellen a postcard. Joellen:	The following summer I got a postcard from Europe from her. And the postcard said, "Just telling you how much I love the dulcimer. I'm here in Crete. It's absolutely beautiful. And I just love the dulcimer." It was very touching for me. It really meant a lot to me. Patricia:	Joni recalled the time she spent traveling with her dulcimer in a 1996 interview article written by Jeffrey Pepper Rodgers. Quote: "I took off to Europe carrying a flute and this dulcimer because it was very light for backpacking around Europe. I wrote most of Blue on it." Unquote. According to a 2014 Wall Street Journal article, Joni wrote the song "Carey" while staying in Crete and she wrote the song "California" while in Paris, using the dulcimer Joellen made for her. In the following year, after returning from her travels, Joni recorded the Blue album in Hollywood, California. Because her first dulcimer was accidentally damaged, Joni went back to Joellen to get another dulcimer. She used the second dulcimer, called the Princess Dulcimer, to record her landmark album, Blue. The Princess Dulcimer was even more visually stunning than her first one. Its body shape was a combination of an upside-down teardrop on top of a heart, with a flying bird head stock, sound holes with tangled ribbons and mythical birds. Her dulcimer was a musical instrument and a work of art rolled into one. When Blue came out in 1971, it was an instant commercial and critical success. The emotional rawness was a departure from her previous albums. Her lyrics combined simple instrumental arrangements with plaintive personal narratives. Rolling Stone describes Blue as, quote: "utterly alone in her melancholy, turning the sadness into tender, universally powerful art." Unquote. Suddenly a veil seemed to be lifted and many at that time felt that Joni's heart was connected to her audience. Because the dulcimer was the main instrument in four of her songs, Joni used a complex rhythmic technique to drive her songs forward with the dulcimer. Joellen Lapidus explains these techniques that Joni played on the dulcimer. Joellen:	She uses so many great dulcimer techniques that are also guitar techniques. She uses a lift and harmonics and offbeat rhythms and it's just really fabulous. Nobody, including myself, ever did anything like that in the dulcimer. But she took it right from her guitar playing - like, in "California," it's a bar chord. And the tuning is a major chord. It's like - I don't remember what key she's in but it's like a C on the bass, G on the middle and an E on the melody strings - so it's just a pure major chord that she bars. "Carey get out your cane" is in the Ionian tuning. It's like the kind of tuning, it's like the one note and the five note, just C and G, all Gs. And the intro is so joyful and so delicious. And then it's just this one chord position, the whole song. Because the dulcimer is all about open tunings, it was just a perfect fit for Joni. Patricia:	Some of the techniques Joni used came from the 1969 meeting with Joellen in Big Sur. Joellen:	Well, one of the big things Joni lifted from me - when we met at the Big Sur Folk Festival, I did this thing called the slap technique which is a guitar technique I had learned on the guitar but I applied it to the dulcimer, and she thought that was really neat. And actually three of her four dulcimer songs use the slap technique. So, the principle of the slap technique is that you strum, like you ordinarily would - you strum across the strings - and then you just move your wrist slightly so that the side, the fleshy side of your hand, dampens the string. And you don't want it to be two distinct sounds. You don't want it to be strum-dampen. You make it into one sound. Patricia:	After the release of Blue, Joni toured with the Princess dulcimer all over the world. In the late '70s Joellen built Joni a third dulcimer with a whimsical head stop design, called the Jester. You can see photos of Joni's three dulcimers on our website, dulcimuse.com/podcast. In the late '70s Joellen made dulcimers for other known musicians as well. They include David Crosby, Jackson Browne, Wendy Waldman, and Garth Hudson from The Band. Joellen:	I stopped in 1978 and then I didn't build instruments, and went through a lot of personal life changes from '78 to 2010. I went back to school, I became a therapist, I went back to school again and got my doctorate - and I've been doing that, supporting myself. And I played a little music the whole time, but my shop - I rented it out to some people for a while and I just kept everything, hoping that one day I would start building again. And in 2010, that moment came, and I built this dulcimer called the Pelican Dulcimer. I took an image of a pelican with its wings fully out in flight, like landing, and I did a very complicated inlay. There's probably over 30-40 pieces of different materials. It's a very dramatic picture of a pelican landing. And then the fret board is just covered with, I don't know if it's eight or ten different kinds of pelicans, all out of mother-of-pearl. Patricia:	Today, Joellen is building a limited number of dulcimers. Joellen:	I'm building an instrument for one of my students right now, which, she loves the ocean so it's going to be all about jellyfish. You know, what I love to do is work a design up with an individual, finding something that's really meaningful for them. And then, what I tap into is the universality of that symbolism and also how it touches me. I'm not a manufacturer - I just don't manufacture dulcimers; I make just a few at a time and they have to have some kind of real thematic or - I like to use the word 'totemic' - like some personal meaning symbolism for myself and the person. Patricia:	This concludes our conversation with Joellen Lapidus. The music in this segment is from Joellen. To find out how the Big Sur landscape affected Joellen's dulcimer building and her improvisational style of playing the dulcimer, watch our film, Hearts of the Dulcimer. You can find a link to Joellen's website on dulcimuse.com/podcast. Our second guest is Rick Scott. Rick is Canada's leading proponent of the mountain dulcimer and has been playing the dulcimer professionally for over 40 years. He has performed in nine countries and released 18 recordings and has received numerous awards. His latest release is The Great Gazzoon, a four-hour, four-CD musical audio novel about a little boy who saves his community with his love of music. In our second Joni Mitchell dulcimer story, Rick has a lively conversation with Wayne. He recalls being picked up by Joni while hitchhiking in Canada with his friend Taki Bluesinger and dulcimer builder Rick Stone. Rick Stone is also known as JR.
Rick:	This is in '71 in the summertime and we were coming out of Vancouver. I was sort of hanging out more in the art scene than the music scene, with my dulcimer. One of the people that was part of that was a guy named Taki - Taki Bluesinger. And Taki Bluesinger was a photographer from Tokyo. And he was doing a show of his photographs in a place up here in British Columbia called Pender Harbour, which is also where Joni Mitchell bought a property. Everybody knew she was building a home but nobody was seeing her or anything. She'd come and go, back to California and stuff. We were hitching up the highway to go to Pender Harbour. And it was myself and Taki and Rick Stone, who was playing music with me at the time. I believe - I think my first wife was with us, and our dog. Hitchhiking was not easy with a group like that. Plus, Taki's cameras and we were carrying all his photos. It was just a big mass of hippiedom traveling up the highway. And this beat-up Ford Pinto came down the road and we're sitting there with our thumb out - the Pinto pulled over and we all piled in. And there was a woman driving. And then I got in the back with JR and Taki, and my wife and our dog got in the front. The dog immediately put his head in the driver's lap and went to sleep. I guess we got about a quarter mile up the road and all of a sudden we realized who the driver was, which was Joni Mitchell. What a shock. You talk about sucking wind, man, it was just - and she's just cheerfully chirping away about - I keep remembering her expression in those days was, everything was "way out" - "Oh, that's so way out, you're doing a photo show?" And we're trying to talk but it's more like we were just trying to breathe. Joni Mitchell was driving the car. And so she'd ask us a question and we'd go [chokes, coughs]. We could barely speak. So up the highway we go, and she's petting my dog - just, you know, everything is just so nice and she's being so sweet. And this car is really a beater. I mean it's just cranking along. And we get to the place where she's turning off to go to where her house is being built, or was just finished getting built. We still had another ten miles to go so we all pile out of the car and, of course, everywhere I went I carried my dulcimer with me - everywhere. And so, as I got out, she said, "Oh, is that a dulcimer in your case?" And I went, "Yes it is," and she goes, "Oh, way out. Could I look at it?" So there we are on the side of the highway - I take my dulcimer out and she holds it, she turns it around in her hands, she strums it, and she goes, "Oh, this is beaut - who made this?" And I pointed to Rick, who was standing there with his jaw dropped. And, "Oh, this is so way out. Would you make me a dulcimer?" And, through an interpreter, we said, "Yes, he will. He can't speak right now but he will make you a dulcimer." And so she got our address in Vancouver and said, "I'll come by and we'll talk about what kind of dulcimer I'd like to have." Then she says, "Well, I've got to go now. I'm picking up a friend at my house and we're going to go up to the pub," which was closer to where we were going. "So, if you still haven't gotten a ride by the time we come back out, we'll figure out a way to get you all in the car and I'll take you that far." So, of course, we did not hitchhike. We just stood on the side of the road, waiting for her to come back out of the driveway. And she did, with her friend, who was Graham Nash. Wayne:	Yeah, Blue just came out. Wayne:	Ooh. Lot of money back then. Lot of money. Rick:	She was the queen, man, and she had so much class, so much grace. And she was so kind to JR because JR was a very humble man. I mean, he was not a man of many words, and around Joni Mitchell he was a man of no words. And it was very interesting in that, years later, I picked up a copy of the Rolling Stone and there was a picture of Joni Mitchell, playing the guitar, but on the wall behind her was JR's dulcimer. And I clipped it out and sent it to him, saying, "Damn it, JR, I thought I was going to be in the Rolling Stone before you. Apparently not. You beat me to it." You know - congratulations and stuff. But that's the story of Joni Mitchell. Rick:	Yeah, it's very way out. Patricia:	The music in this segment is from Rick Scott. You can find a link to Rick's website on dulcimuse.com/podcast. Next up are two dulcimer event announcements. There will be a Jean Ritchie memorial and legacy concert and film screening at McCabe's in Santa Monica, California, on Sunday, August 2nd, at 8 p.m. The featured performers are Susie Glaze and Joellen Lapidus. This event will also be screening our film, Hearts of the Dulcimer. Proceeds will benefit Appalachian Voices in the name of Jean Ritchie. The annual Redwood Dulcimer Day Festival is coming up on August 1st in Northern California. Wayne spoke to Ron Beardslee, one of the teachers at this year's Redwood Dulcimer Day. Wayne:	On the phone with us is Ron Beardslee, who is one of the instructors for Redwood Dulcimer Day. Ron, tell us more about Redwood Dulcimer Day. Ron:	Hi, Wayne. Thanks for letting me talk about Redwood Dulcimer Day. It is coming up August 1st, again, and this year it will be in Scotts Valley, a really nice little town just outside of Santa Cruz, California. We're going to have workshops at basically all levels from beginners to very experienced people. This will be the 16th annual running of the event. There will be 16 classes offered. And, as usual, there's going to be a really great faculty this year. The guest artist will be Erin Mae. She's a former national champion. I think she won the national championship at age 17. Nice to see some young people getting involved in the dulcimer world. Classes will also be offered by Steve Eulberg, Neal Hellman, Peter Tommerup, Janet Herman and Laura Devine Burnett. A couple of special features this year will be Richard Standard and Shelley Phillips offering a children's class, where children can make their own cardboard dulcimers, decorate them, and learn the basics of how to play the dulcimer. And it's awfully nice to watch the kids get involved. In addition, Steve Eulberg will be directing a dulcimer orchestra. He's put together, arranged some parts. The orchestra will have the opportunity to play the next day, Sunday morning, at the church where the Redwood Dulcimer Day is being held. And it's always fun to play in an orchestra where you're working different parts, working different arrangements, rather than just playing in unison. Enrollment is $60 and you'll get more information through the website, which is communitymusicschool.org. Community music school is one word, dot org. Just following the workshops in the evening, there'll be a faculty concert and that's always a lot of fun, to hear these really great players, like Erin Mae and Steve Eulberg and so forth, play. Wayne:	So, Ron, you'll be teaching the beginning class? Ron:	I'll be teaching one of the beginning classes. I'll be teaching a transitional class, doing the true beginners and intermediates. It'll be a class on how to advance your playing skills; learn some of the techniques you need to smooth out your playing and become more effective. Wayne:	If I'm a real beginner and don't even have a dulcimer, you guys have a loaner dulcimer for me to borrow, right? Ron:	Yes, certainly. There'll be plenty of other dulcimers. I would recommend that they contact RDD - Redwood Dulcimer Day - through the website first, to make sure that they reserve one. Just to make sure. We always have enough but I was always kind of worried that we'll leave somebody out. So please contact RDD in advance. Wayne:	So what is the website for Redwood Dulcimer Day? Ron:	It's called communitymusicschool.org, community music school being one word, dot org. Wayne:	And on the website, there is a registration form and directions to get to the venue? Ron:	Right, there's directions, and it's right off the freeway coming right out of San Jose to Santa Cruz. It's very easy to get to. It's on the main street in town so you can't miss it. It's at St. Philip's Episcopal Church. The address is 5271 Scotts Valley Road. Wayne:	Great. Well, thanks for talking to us, Ron. Ron:	Well, thanks for the opportunity, Wayne. Appreciate it. Patricia:	That's it for today. We'd like to thank our guests, Joellen Lapidus, Rick Scott and Ron Beardslee. For information about today's guests, the music played, as well as photos and links to the articles we mentioned in this episode, go to dulcimuse.com/podcast. Thanks to those who wrote to us after our first episode. We really love hearing from you. Keep those comments and suggestions coming. We plan to read some of them on our next episode. If you have any dulcimer events you'd like us to announce, write to us at dulcimuse.com/podcast. Hearts of the Dulcimer podcast comes to you from Patricia Delich and Wayne Jiang. Thanks for listening. Until next time, keep on strumming your dulcimer. This article has been viewed 4,375 times since being added on September 26, 2015.